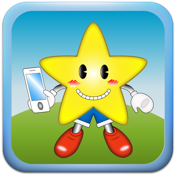 Parents and children can both enjoy playing with their cellphone and camera by using this app! Children are always curious and wanting to use mom and dad's cell phones! Have you ever had an issue where you let your child play with your phone, and they accidently dialed a number that is stored in your contacts? If so, let your child enjoy and play with the "Chloro's Kid's Phone"! * When you press the call button, the voice recording of Mom and Dad can be played. * The button will change when you press the mode switch button, and you will be able to see fun animation. * Animations consist of animals and vehicles, in which there are 10 of each, and when you insert particular digits when in numberic mode (such as 911), extra animation will be provided. * To make a recording for voice chat, press the record button. Press play to hear the recording. * [Function restriction release version] You can set incoming call ringtone and vibration intervals, and when there is an incoming call, you press the call button to answer the phone. * As soon as you take a photo, you can view the image immediately. * Since the photos taken by your child will not be saved, there is no need to attempt on deleting the photos! * You can take photos with nice frames by selecting photo frames when pressing the frame switching button. * You can take photos with fun character icons. * You can add character icons to photos that have been taken. When your child watches you on the phone and asks to play with it, lend your phone to your child and let them use the "Chloro's Kid's Phone". An active child can not sit still and is persistant to play during mom and dad's shopping or eating out. When you're troubled on the go without any toys, etc., you're going to think about how to keep your child calm and put. At times like these, let's have them happily playing the "Chloro's Kid's Phone".